Jacaranda is a genus of 49 species of flowering plants in the family Bignoniaceae. It comes from tropical and subtropical regions of Central America, Mexico, South America (especially Argentina, Brazil, Peru and Uruguay), and the Caribbean. It is also found in Asia, especially in Nepal. It is found throughout the Americas and Caribbean. It has also been introduced to Australia, New Zealand, India, Fiji and parts of Africa. The genus name is also used as the common name. Jacaranda can be shrubs to large trees. They range in size from 2 to 30 m (6.6 to 98.4 ft) tall. The genus is separated into two sections, Jacaranda and Dilobos DC. Section Jacaranda (which includes Blue Jacarandas) has 18 species. It is found mostly in western South America, Central America, Mexico, and the Caribbean. Section Dilobos, which is thought to be the oldest form, has 31 species. It is found mostly in southeastern Brazil. This includes the Paraná River valley. The kind of wood in the two sections is also different. ↑ "Jacaranda Juss". Germplasm Resource Information Network. United States Department of Agriculture. 2005-02-09. Retrieved 2009-07-22. Wikimedia Commons has media related to Jacaranda. 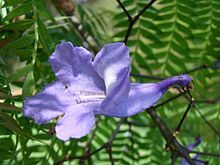 Wikispecies has information on: Jacaranda. This page was last changed on 14 March 2019, at 09:50.